What Dragon-themed set would be complete without Lance? Surprisingly the answer is a lot, considering he didn’t show up once in Dragons Exalted or Dragon Vault. Figures it would take him a while to get over here – probably got held up for those illegal Dragonites he’s been carrying around with him. Lance <Prism> is a Supporter that can only be played when one of your Pokemon got KO’d last turn, and when you do play it, he brings out 2 Dragons straight from your deck and puts them directly onto your Bench – no need for evolutions, no need for holding back, just go all out. He’s like a better version of Archie’s or Maxie’s!…which is ultimately debatable, considering those cards draw you more cards and don’t get sent to the Lost Zone if they’re discarded. The real question then is, what can be done with Lance <Prism>? Cause after a few years, there are a lot of Dragon-Types in the TCG, especially in Expanded. Admittedly in Standard though, there aren’t too many – Rayquaza-GX and Ultra Necrozma-GX come to mind from outside the set, but there haven’t been a lot of Dragon-centric strategies to really take advantage of Lance <Prism>. In this set, we’ve got stuff like Altaria and Altaria-GX, Drampa, Dragonite-GX, Flygon – definitely a lot more options to work with, and a lot better options too! Overall the success of Lance <Prism> is ultimately going to fall on the Dragon Pokemon that come out in his time frame. The more Dragons there are, the better he gets – there aren’t too many cards that can accelerate out a M Rayquaza-EX or more Altaria or even the different Kyurems! …but not the Pokemon BREAK. That just breaks the game. Arora Notealus: Of all the cards that made it into the Top 5, Lance was the only one that didn’t end up on everyone’s list. He still ended up on most of the lists, and as a pretty big choice too, hence why he’s ended up in 3rd over Blaziken and Blaine. Heh, go figure, as Lance ended up gaining the upper hand against him in the Pokemon Adventures manga too. Seriously, go read it, it’s good stuff! Next Time: Come to think of it, I just mentioned her in this review too. Claiming the number three spot is Lance Prism Star! As a Prism Star, you can only out one card of the same name in your deck. And if it tries to go in the discard pile, it gets sent to the Lost Zone, where cards cannot be claimed back. That makes it a card that is hard to search for and risks being in the prize card pile more often than if you had four copies of said card. As a Supporter card, it can be used once per turn unless you have obscure cards like Magnezone with the Dual Brains ability that can let you use two Supporters per turn. With that out of the way, Lance works if one of your Pokemon was Knocked Out during your opponent’s last turn, and if you do, then you get to put two Dragon Pokémon from the deck onto your Bench. Being Knocked Out in between turns like Burn and Poison doesn’t count. Which means you can put either a Basic, Stage 1, or Stage 2 Dragon Pokemon onto your Bench, regardless if they’re GX or not. For the most part in Expanded, you can even put Dragon type Mega Evolutions, and I’m pretty sure your turn doesn’t end because it wasn’t evolved from your hand. What you can’t do, however, is trying to fetch Break Evolutions because they are incomplete cards, lacking certain information such as Weakness, Resistance, and Retreat Cost. Unfortunately, that means you cannot fetch Noivern Break and Hydreigon Break. This requires timing, and sometimes said timing isn’t always available, which is why I didn’t think very highly of this card, thus not being on my personal list. I can imagine countless possibilities that I can summon with this card, but the obstacles remain, such as having it on your hand AND making one of your Pokemon get KOed. There’s another card in the form of a Pokemon that also summons Dragon types. Specifically, Dragonite-GX’s Dragonporter GX attack puts three Dragon Pokemon from the discard pile onto your Bench, not needing your Pokemon to be Knocked Out, though that takes your GX slot of the game and using up your attack. Still, that easier to pull off than Lance, and with 250 HP, it is a very difficult OHKO outside of Fairy weakness. Notes: Can I take the moment to say that Lance has multiple Dragonites that are underleveled? The lowest level I’ve seen on a Dragonite is Level 40 in HeartGold & SoulSilver (the battle where you team up against an Executive and a Grunt in a hideout underneath Mahogany Town). Or maybe Lance had a couple of Common Candy from Pokémon Reborn (Reverse Candy in Pokémon Rejuvenation) and feeds them to his Pokémon. Lance Prism Star (DRM 61) debuts in the Pokemon Trading Card Game in the Dragon Majesty expansion set. This Supporter card allows you to put two Dragon Pokemon from your deck onto your bench. ANY two Dragon Pokemon. Rayquaza GX? Sure. Ultra Necrozma GX? No problem. Dragonite GX? Yep – it doesn’t say Basics, it says ANY Dragon Pokemon. And, of course, those of us who LOVED Archie’s and Maxie’s know what this means: you can skip any Basic and Stage 1 Pokemon associated with those Stage 2’s. Leave ’em out of your deck. This frees up potentially EIGHT card slots. It’s a little bit of a risky proposition if Lance gets prized, but we do have Gladion (which is also possibly the best card that nobody plays). There is a stipulation: you have to have a Pokemon KO’d in the turn immediately preceding the turn in which you can play this card, but it’s again ANY Pokemon, not just a Dragon Pokemon. Another downside is that this is also a card that you can’t play until your opponent is built up enough to actually take out a Pokemon. For some decks (Rayquaza GX) this isn’t a problem; for others (Metagross GX Solgaleo GX), yeah it might take a couple of turns before you can get to use Lance. And then, of course, you’ll have to have Lance in hand or have a way to get it in hand. Not impossible with Tapu Lele GX, but there’s definitely a range of possibility that you’ll miss being able to execute on Lance (not sure what that range is 25% 33%? I think it’s less than 50% though), especially considering that you won’t be able to use a Supporter in the turn you need to play Lance to help find him. So Lance isn’t perfect, and as I mentioned to Otaku when discussing this card, if you’re counting on using Lance and Zinnia as part of your strategy, realize that strategy automatically includes giving up two Pokemon, which could leave you with as few as two prizes remaining once you’ve executed on this plan of development. While I think Lance is a good card, it might clog up your hand early game or it might potentially require you to put an easy two prize Tapu Lele GX on your bench to pull it out of your deck… but then you could use Zinnia after that Lele got Guzma’d up and KO’d. I’ll bite on the dropping two Dragons on the bench, though. It could even be two Altaria to boost your damage by 40 points. Or two Garchomp, maybe that will actually make him playable! Fun Fact: Today marks the 15th-anniversary of my writing Card of the Days for Pojo.com! Lance [Prism Star] (Dragon Majesty 61/70) is our third-place pick from the new mini-set. It is a Trainer-Supporter and a Prism Star card; its effect states that you can only use Lance [Prism Star] if one of your Pokémon was KO’d during your opponent’s previous turn and that when you use it, Lance [Prism Star] allows you to Bench up to two [N] Pokémon from your deck. I’m going to focus on the “good” aspects of this card first. Lance [Prism Star] allows you directly play a Stage 1, Stage 2, or Mega Evolution Pokémon to the field. No lower Stages required and (for the Mega Evolutions) no turn-ending. You can use this on Basic [N] Type Pokémon as well, and I am glad that is an option, but that is usually a waste. There are no [N] Type Restored Pokémon, but if there was, then you could use it on them as well. Of the existing Stages of Evolution in the Expanded Format, only BREAK Evolutions cannot be targeted via Lance [Prism Star], as they are “incomplete” without their lower Stage, literally lacking a Weakness, Resistance, and Retreat Cost stat. The bad for this card is pretty obvious; Prism Star cards are either “one and done” or “none and gone”. Even if you don’t actually use its effect, if a Prism Star card would go to your discard pile, instead it goes to the Lost Zone due to its own text. Lance [Prism Star] is also a Supporter, so you can’t use it the same turn you use a Cynthia, Guzma, Zinnia, etc. You can still fetch it from your deck with Tapu Lele-GX, but Supporter support like PalPad or VS Seeker aren’t options. Just be glad I don’t see a lot of folks using Tormenting Spray, though that might change if enough Prism Star Supporters become popular. With only one usage of Lance [Prism star] possible, and the dual risks of it being stuck in your Prizes (possibly the entire game) or prematurely discarded, you simply cannot rely on it. Even if you otherwise do everything right, the timing may wind up botched and you either never get the chance to activate it or you do but don’t have the [N] Pokémon you REALLY want still in your deck. The ugly is how messy it is to really go in-depth explaining how your opponent can frustrate your efforts, even without direct means like Tormenting Spray. Trying to keep it simple, yes it is possible you’ll face a deck that will never score a KO in a manner that will allow you to play Lance [Prism Star]. I haven’t seen any such decks recently that have also proven competitive; just be aware they that could be out there. The real concern are decks that can read the situation and either pace their KO’s, manipulate your hand, or do both so that you cannot activate Lance [Prism Star] in a timely manner. As is, you won’t be pulling off Lance [Prism Star] on your first turn, the best you can hope for is your second turn (overall T3 or T4). You’re going to want an early-game Pokémon your opponent cannot afford to ignore, or else your opponent will do just that while setting up his or her side of the field. Whatever your Benching directly cannot be vital to your own strategy unless you have an additional method of getting them into play. With all that said, Lance [Prism Star] actually is one of the best cards in this set; I actually expected to see it rank a bit higher, though third-place is still good. If Zinnia is as good as I think she is, there is a bit of conflictas one chance to use Zinnia has to be sacrificed to instead use Lance [Prism Star], but speeding two of your [N] Pokémon to the field will often likely be worth it. It is a once-per-game power play, suitable to a Prism Star Supporter. If your deck is built around any [N] Evolution other than a BREAK Evolution – does anyone use Hydreigon BREAK or Noivern BREAK? – you’ll include this card for when it does do amazing things. Especially with the release of Dragon Majesty, there are several [N] Pokémon that would be great to have on your Bench except you don’t want to have to run their lower Stages and manually Evolve into them. These are Pokémon that help you “win more” when they show up but won’t lose the game if they aren’t available. There were no Pre-Releases for Dragon Majesty, as it is a mini-set intended to only be available in products like three-booster blisters or gift sets. 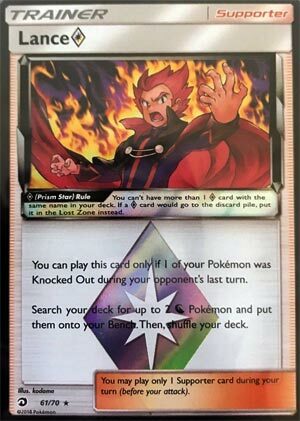 As you cannot buy a booster box, I don’t think you can run a sanctioned Limited Event, but if you’re doing so for fun (or I’m just wrong), as long as you pull some decent [N] Pokémon that can work with the Energy you’re using for the rest of your deck, then they and Lance [Prism Star] should be added to that deck. They might not show up in time, but you likely have room in your deck and not a lot of other Supporters to include.